It was actually a mountain not a hill and when you go up one of these in winter, spring, autumn or summer you are not always guaranteed a view. This time we did and it is amazing to look out and see snow capped peaks in every direction. The group this time were all instructors from the Outdoor Ed team all working towards assessments at various levels. We were also joined by Gordon from Glasgow who we met in the car park and was grateful for the company. Although I have enjoyed quite a number of winter walks over the past few years this was my first opportunity to get stuck into the winter skills of using ice axe and crampons (we didn't use the crampons in the end as the snow stayed quite soft). The wind was a blustery 60mph on the top of Ben Tuallachain, our only peak of the day, so we didn't hang around there. The descent was made more interesting as we found a good snow slope and practised with the ice axe. An excellent day out and a good shakedown before the ML course next week. Thanks to all on the trip for the company and tips. Well I have survived the first days with Fife Council. My new job is Outdoor Learning Officer with the Outdoor Education team based at Lochore Meadows Country Park. I am really happy to be working in the outdoors industry again as I have definitely missed it since leaving Ireland. I am also thrilled to be only driving 25 minutes to work. It is a great idea starting a new job on a wednesday as the first few days are always a bit of a shock to the system. There are a great bunch of people working there and everyone has been very welcoming. Looking forward to the weekend now and Eilidh's 5th birthday party tomorrow. I have posted a couple of pictures which show the view from my new office. It's a great location as you can see so I hope to see you down there sometime. I am enjoying the last 2 days of holiday before starting a new job as Outdoor Learning Officer with Fife Councils Outdoor Education team. I am really looking forward to getting started and working with the team up at Lochore Meadows. Until then I am making the most of the freetime. We are lucky enough to live in a village where we can walk for just a few minutes and be out into rolling fields and fantastic woodlands. This morning, after dropping the girls to school and nursery, Beckie and I indulged ourselves with a walk up to the Dean plantation. It was a cold day but sheltered in the woods and not too wet (just very muddy). Being a Kidz free walk we managed to set a decent pace and covered a good distance in the hour and a half time slot we had. Obviously the coffee stop was built in to the time schedule ( I am on holiday after all). OK it may be stretching the outdoor theme slightly but it was on the programme last weekend. Beckie was off gallavanting to Ireland to teach at a craft show. 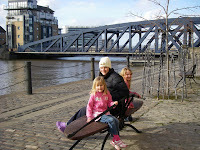 I headed over with the girls to visit Auntie Kirsten in her new flat in Edinburgh. We were heading down to Ocean Terminal to spend vouchers in the Build a Bear shop. Not requiring a map for this outing we optomistically thought it would take 20 minutes to walk down there. It actually took 40 minutes there and 40 minutes back. That's a fair walk for a 4 yr old (it was actually 7yr old Beth who put up most complaints) even if it is to buy a cuddly new bear. It made me think about challenge and how we perceive things so differently according to our age, interests, experience. To me challenge was hiking up Ben Vorlich on a sunny but very cold and windy winters day. To the girls the hour and a half walk in Leith docks was a challenge. Both trips fulfilled the criteria for this blog which is getting out and enjoying the Scottish Outdoor and both were equally enjoyable. You may have noticed there's not much to read on this blog. I am not too much of a writer and prefer to say the basics and let the pictures or your imagination do the talking. Having said that I was chatting to my sister a few days ago and we were talking about the amazing views we had on the Ben Vorlich walk but also how much wildlife we had seen. The first spot was while still driving down the narrow snow covered track along the south side of Loch Earn and nearly running over a red squirrel. They are basically smaller and cuter than their big grey cousins and I don't ever remember seeing one in Scotland before. Next up was the amazing line of deer on a neighbouring hillside. I have seen lots of deer before but always hanging out or moving in a herd. There is a photo on the slideshow where you can make out a long, winding single file line of deer making their way up the hill. We estimated there must have been 50-60 in the line. Can anyone shed any light on this behaviour. Andy's dog Brinkley didn't even make an attempt to keep up with the mountain hare that shot across the hill only about 10m n front of us. Finally we were treated to an aerial display from a number of birds of prey which we unfortunately were not able to identify. Initially the 4 birds appeared to be jousting together with 2 larger birds fending off 2 slightly smaller birds. One of the larger birds then appeared soaring in the fresh breeze blowing up the hillside just a few metres above us. Our best bet as a group was a buzzard but nobody was claiming any expertise in this field. For a very cold winters day out in the snow it was quite a feast of Scottish wildlife. Enjoyed a cracking walk this morning with Andy and sister Kirsten (my sister not as in a nun). For once this winter we had clear weather - absolutely freezing (-20 wind chill) at the top but amazing views. Well worth the early start. Hope you enjoy the photos - Scotland's Winter Wonderland.